At a conference in New York on Tuesday, Aereo unveiled (PDF) plans to give Internet-capable devices the ability to watch ABC, CBS, CW, Fox, NBC and PBS in real-time without the aid of a TV tuner. The stations are served through an elegant yet simple HTML5-based website. As a result, Aereo should be compatible with any device which can fully support the web standard. Noteworthy devices on the compatibility list include the Kindle Fire, Roku Box, iOS and Android devices. Although broadcast companies offer their programming over the air for free, Aereo hopes to charge $12 per month for the service. Such a subscription may be difficult for many to swallow, but the website also offers DVR-like functionality to record shows, rewind, pause and more. The ability to receive streaming broadcast television to devices like an iPad may also be appealing enough for some to take the plunge. Of course, even if you don't care about broadcast television, Aereo will at the very least be controversial. IAC CEO Barry Diller, who led a $20 million funding round, says Aereo will eventually be a “wedge” that will force the TV industry to give up the bundle: The idea is that eventually you’ll start by paying Aereo $12 a month for a bunch of TV, and add a series of channels and programs that you like on top of that. In theory, you’ll still end up paying much less than you do now. Although various precedents suggest Aereo can't legally stream live broadcast television over the Internet to millions of people, the company believes it has a clever work around -- antennas -- lots of them. The antenna arrays themselves are scattered throughout Brooklyn, New York and each array holds thousands upon thousands of micro-antennas. The company's CEO, Chet Kanojia, seem to agree with AllThingsD that their clever antenna design was not engineered to be efficient, but rather engineered to comply with current content laws. 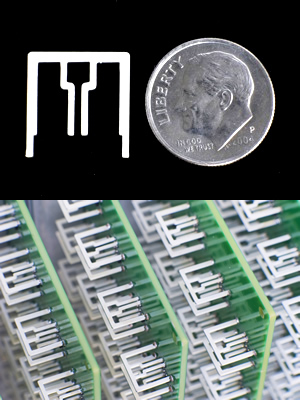 Aereo's rather novel approach makes certain there is an antenna for every single subscriber at any given time. By doing so, the company hopes to navigate a legal mine field that no other enterprise has managed to cross. Perhaps they will spin themselves as a long-range antenna rental service or try to qualify as a cable system in order to license content at fixed government rates -- those are just a couple of the possibilities, but it is hard to tell where Aereo may be headed. One thing is for sure though, broadcast companies will be less than pleased. For now, Aereo will be available exclusively to subscribers in New York City beginning on March 14. The company is also offering a 30-day free trial. Aereo's FAQ can be found here for more information.